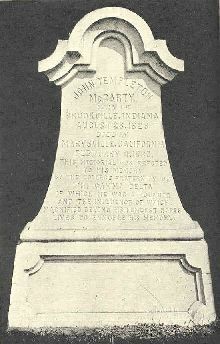 "Mac" or "Johnty," as he was called by his brothers, was born in Brookville, Indiana, to Scotch-Irish parents on August 28, 1828. His father was wealthy, making his money from merchandising, large-scale farming, pork packing, selling real estate and operating stage-coach and canal-boat lines. In addition, he was a prominent Mason and member of the state legislature. John’s mother was a cousin of statesman John C. Calhoun. McCarty was educated in the public schools, studied Greek and Latin under a local clergyman and at seventeen went to Oxford, Ohio to enter Miami University. There he remained for two years, pursuing only a "partial course," before matriculating to Jefferson College in 1846. At Jefferson, he soon determined to establish a new organization, whose emblem is now so proudly borne by so many. McCarty the student is described as a young man of unusually fine physique, open-hearted, generous, genial, sociable, and very popular. He was a clear thinker, a vigorous writer, a forcible speaker with a ready wit; his frank Western manner and joyous laughter made him loved by all. At the same time, he was a born adventurer and fighter, as his later life disclosed. Immediately after his graduation, he returned to Brookville to take up the study and practice of law. Being, however, of a high-spirited and adventurous nature, he soon organized a company with himself as captain and set out in the spring of 1849 across the plains with the "Forty-niners" to search for gold in California. The diary which "Mac" kept of this perilous journey is historically valuable and extremely interesting for its descriptions of the country through which the wagon caravan trekked and for its accounts of buffalo hunts, of Indian troubles, of cholera epidemics, of hunger, thirst, privation, and death. By virtue of both vested authority and natural ability, "Mac" was the leader of that expedition across the continent. It was he who blazed the most difficult trails, first swam the rivers, killed the first game and dug the first gold. It was he, too, who had all the dealings with the native Americans, in one instance overpowering a hostile Indian in hand-to-hand combat. To us, the most amazing and inspiring incident of the entire journey was a chance meeting between McCarty and another member of Phi Gamma Delta, Bolivar G. Krepps (Washington ’49), each independently seeking his Eldorado in the gold rush, on the banks of the Sweetwater River on the evening of June 7th, 1849. Neither had ever seen the other before, yet they met in the midst of the trackless west at a time when the entire roll of the "Delta Association" numbered not more than twenty-five. McCarty’s diary tells of the splendid feast with which they celebrated and of the many hours of fellowship and conversation which followed. Before parting, they stood beside that limpid stream and, with uncovered heads, ‘neath the brilliant stars, drank a solemn toast to the prosperity of the "Delta Association" and to all brothers who should live after them. Upon arrival at the gold fields, the adventurous group of "Forty-niners" fared none too well and the company shortly disbanded. McCarty we nt to San Jose, the seat of the first California government, where he became clerk of the first legislature. In February, 1850, he moved to Marysville, California, to practice law, and was twice elected county recorder and criminal court judge. In 1853, he met Mary E. Pierson, becoming so interested in her that when she went East to school the next year he followed her. While crossing the Isthmus of Panama on the way to New York, he contracted the "Panama Fever" which undermined his health and led to his death six years later. Nevertheless, he and Mary were married in 1854 and after an extensive Eastern honeymoon, returned via Brookville and New Orleans to McCarty's new house in Marysville. There one daughter was born, whose presence was the highlight of the Portland Ekklesia of 1938. Up to 1860, John T. had been a man of considerable wealth, but through the misfortune of a man whose bond he had signed, he then found himself suddenly in difficulties. On the advice of friends he resolved to recoup his fortunes in the Nevada mines and sold all of his property preparatory to moving. Just before his scheduled departure, he was stricken ill. He died February 4, 1860. He was buried in the cemetery at Marysville, where his resting place was marked by the Fraternity with a handsome stone fittingly inscribed: ". . . erected to his memory by the College Fraternity of Phi Gamma Delta of which he was a founder and the influence of which, magnified beyond his fondest hopes, lives to ennoble his memory." In 1938 his remains and the stone were removed by the Fraternity to the Sierra View Memorial Park in the same city. In 1932 the Fraternity moved McCarty's remains to another nearby cemetery. Hence, the directions provided in The History of Phi Gamma Delta, Tomos Alpha are incorrect. Drive north from Sacramento on State Route 70 for around forty miles until you are five miles south of Marysville. As the highway becomes four-lane, you will see a McGowan parkway off-ramp. Take that exit and turn east at the stop sign; proceed to Olive Avenue, turn left, and continue north, which will bring you to the gates of Sierra View Memorial Park. McCarty's gravesite is located at the extreme back part of the cemetery on the left side of the mausoleum towards the equipment garage, under a large tree. It is on Lot C, Section 40, Block 6.